• Ampersand Artist Panel primed canvas-textured board 18x24in. 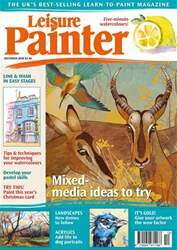 Welcome to the December issue of Leisure Painter. 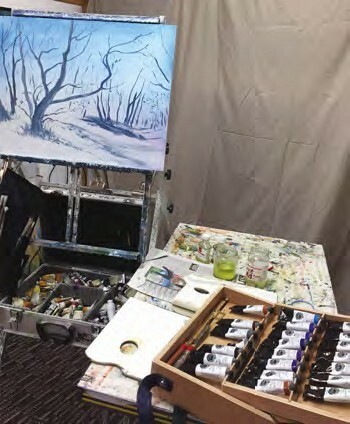 As always, the issue is packed full of demonstrations and tutorials for you to follow, from watercolour, pen and wash and pastel to acrylics and oils. Liz Chaderton demonstrates how to add gold leaf to your paintings for that added wow factor and Julie King offers inspiration for this year's Christmas card. There are three quick practices to help you paint watercolour with more confidence and our cover artist, Shelly Perkins shares her unique methods of combining traditional and digital techniques in 'Pencils, Paint and Pixels'. Find out where some of the best exhibitions, art events and art club shows are running this month, books to read and so much more! Enjoy your month of painting with Leisure Painter.